Goliath of Gath is one of the few giants in the Jewish-Christian tradition. This Philistine warrior is mentioned in the Bible, 1 Samuel Chap. 17, during the narrative of the war between Israelites and Philistines in the Valley of Elah. According to the story, during forty days in a row, Goliath challenged the Israelites to send a champion to decide the war in a single combat against him. Saul promised a reward to the man that would defeat the giant and, famously, David -then still a child- asked to face the challenge. To the combat, he only took his sling and five stones. 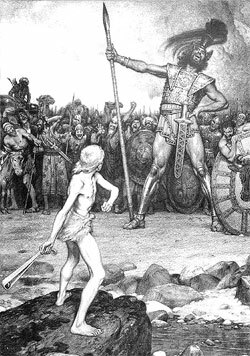 Invoking God's help, the child hurled a stone with all his might, and hit Goliath in his forehead. As the giant fell on his face, David took Goliath's sword and cut off his head. The Israelites won the war, and David later became their king. A well-built Goliath would have weighted the same as about five normal men. The following image shows the giant and five other Philistine warriors in a break during training. Though not mentioned in the Bible, we are allowed to imagine that Goliath had a boyfriend among his fellow soldiers. Here we have a few pictures of the couple. Goliath made many slaves of his defeated enemies. He used them in several ways, as shown in the images below. When will you have some giants from the time of Enoch ?